Hello! 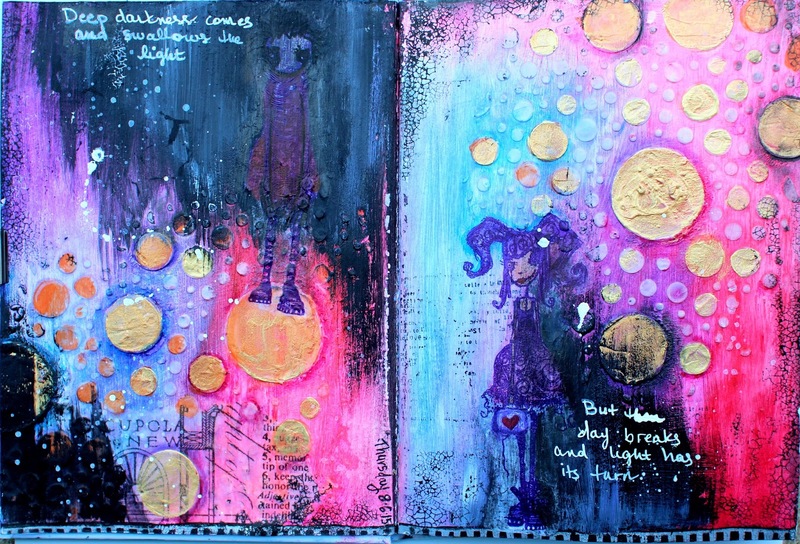 Yesterday I shared the cover of my August 2015 art journal, and today I will share the first two spreads in it. The first two pages were made using gelatos, paint, a Prima stencil, and molding paste. The stamps are by Stampotique and I stamped them on tissue paper with Staz On ink, cut them out, and added them to the pages. I also used stamps for the lettering and crackle effect, Tim Holtz tissue paper, and Pitt Big Brush markers to add some coloring and details. The white marker I used to write with is by Sharpie. The second spread above has the lyrics to "The Logical Song" by Roger Hodgson of Supertramp (you can listen to it HERE). I used BoBunny paper on both sides to represent the two parts of the song - the "Enchanted Garden" collection on the first page and the "Pop Quiz" collection on the second page. I used Crafter's Workshop stencils for the trees, large numbers on the 2nd page, and the black dots. I tore up papers and pasted them on, and then added gelatos on top for color. Well, I hope you guys enjoyed the first to pages. Come back the rest of this week for more of the art journal.